Presentation Speech by Per Wästberg, Writer, Member of the Swedish Academy, Chairman of the Nobel Committee for Literature, 10 December 2007. 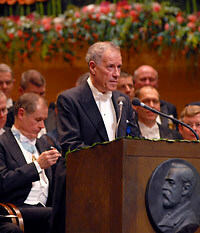 Writer Per Wästberg delivering the Presentation Speech for the 2007 Nobel Prize in Literature at the Stockholm Concert Hall. Doris Lessing is part of both the history of literature and living literature. She has contributed to changing the way we see the world. In all probability, no other Laureates has accumulated such a volume of work. We stroll through the great library of her work, where all sections are unmarked and all genre classification pointless. There is life and movement behind the broad or narrow spines of the books, resisting categorisation and the imposition of order. Lessing links to the great narrative tradition of the 19th century but equally we may use her works as textbooks in 20th-century behavioural patterns, not least to discover the way many thought – or thought wrongly – during one of history’s most turbulent periods as war succeeded war, colonialism was unmasked and communism in Europe conquered. She has revealed the totalitarian temptations and shown us the strength of undogmatic humanism. She has displayed an almost limitless empathy with odd lives and a freedom from prejudice regarding every form of human behaviour. She was early in flagging global environmental threats and poverty and corruption in the Third World. She has given voice to the silent and to the refugees and homeless of our century – from Afghanistan to Zimbabwe. And as few others have done, she personified the woman’s role in the 20th century. She makes us exclaim: “How could she know?” since she was often first to speak about what no one else did. For her, nothing was too unimportant or insignificant. Which is why she batters at our hearts. But although she resembles a continent that initially defies exploration, she has never subscribed to the idea that the world is too complicated for clarification. Undeterred, she peers under mossy stones and mouldy linoleum flooring, shying from nothing, and therefore becoming help and support for innumerable people. Like Frances in The Sweetest Dream, she takes care of everyone, a hospitable earth mother – later compiling perspicacious case studies of her visitors. Doris Lessing writes as she breathes – to approach closer the trials and revelations of our existence. Eschewing protective gloves, she grasps our reality like a grubby root vegetable, uncovering experiences we did not realise we could access. Via thousands of intimate details and in lower-case letters – dare we call them feminine? – she phrases the eternal questions of how and why we live. Her autobiographical novels were succeeded by memoirs from Rhodesia and London: Under My Skin and Walking in the Shade. They vibrate with sensuous life and manage unusually sharp focus in a telescopic rearview mirror, pitilessly probing social critique and a fearless ability to look inward. Lessing struggles with her parents, especially her mother, up to an advanced age, providing us with merciless images of motherhood. From the beginning, ideas, movements and feelings were swirling through the girl, making her a relentless witness of her time, and an authority-antagonist for whom the emperor is always naked. Walking in the Shade ends in 1962 when The Golden Notebook became an epiphany for an entire generation of women. In this, Lessing’s most experimental novel, battle is joined between the will to create and the desire to love. Obstacles are mapped for a woman seeking both independence and intimacy, since her freedom is paradoxically incomplete without the love that in turn undermines it. Lessing shows how conventions and other pitfalls along the way impede sensitive and passionate women from living authentically and fully, from glimpsing into the fifth, golden notebook. Emotions blind and lead astray Lessing’s heroines and endanger their free will. Children of Violence is the collective name for the five books about Martha Quest, Lessing’s alter ego, who, in moving from a colonial existence to the British class hierarchy, is swept away by her dreams and primary instincts. Chiefly female readers identified with Martha Quest’s longing for freedom and disgust at hypocrisy and mendacity. A poor person in a rich society, a woman among men, a white among blacks, Doris Lessing worked to become the independent intellectual she was. She unveils the temptation of devotion to a utopia and absorption in a collective, and she illustrates how a triumphant ideology can deceive us with false redemption. She became a cartographer of disillusionment, drawing dystopias and catastrophes with frightening clarity. Lessing has the ability to freely move into and away from herself, to barge in and become an invisible lodger. She often begins by observing her characters from within and then moving outside them, to strip them of their illusions from an objective distance. We can follow this eerie process in The Summer before the Dark; in the allegorical psycho-thriller about a monster child, The Fifth Child; and in The Good Terrorist, an in-depth account of the extreme leftwing squatting culture that sponges off female self-sacrifice. In her later works, Lessing demolishes a long list of basic values. Left are the networks of family and friends, cats of course, and the foremothers and midwives in every sense who take responsibility, and always too much responsibility. And in this year’s novel, The Cleft, she accords us a parable from the dawn of mankind – before the invention of love. Which is where she seems happiest, among hunters and gatherers, far from a contemporary culture that presages disorder and collapse. Doris Lessing’s epic landscapes shift from honest realism to symbolic fable, from the psychology of self-realisation to saga and myth. Using the lens of intuition, she has charted the changes from the decline of the empire through to a future earth ravaged by atomic warfare. Mara and Dann in the eco-fable of the same name flee from a new Ice Age to an uncertain foothold in what used to be Africa. In her massive Canopus in Argos suite she lets observers from another solar system report on our civilisation’s ultimate phase. She moves freely across the plains of fantasy without raising her voice; she declines the rhetoric of doomsday preachers. Ever since her African debut in 1950 with the tragic novel The Grass Is Singing, Lessing has disregarded boundaries: moral, gender or of habit. Solitude and social ostracism remain her thematic glue. But when she occasionally draws a parallel between love and politics, it is because both stand for the hope we must try to sustain if living is to be worthwhile. Age is no issue in literature. You are forever young and wise, old and rebellious. You are the least ingratiating of novelists. Your bout with destiny and reality is heavyweight-class; nothing has induced you to leave the ring. Throughout the world over the last 58 years, people have been warmed, provoked and led hand-in-hand by your books. You have helped us cope with some of our time’s important concerns and you have created a document for the future to carry forward the flavour of an age, its prejudices and survival strategies, its everyday trifles and delights. Your lifework and your great pioneering effort are today not fulfilled but crowned with a prize you have long deserved. 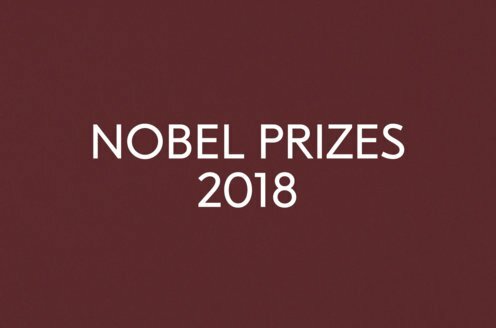 The Swedish Academy sends you its warmest congratulations.